Finiiiiished!! 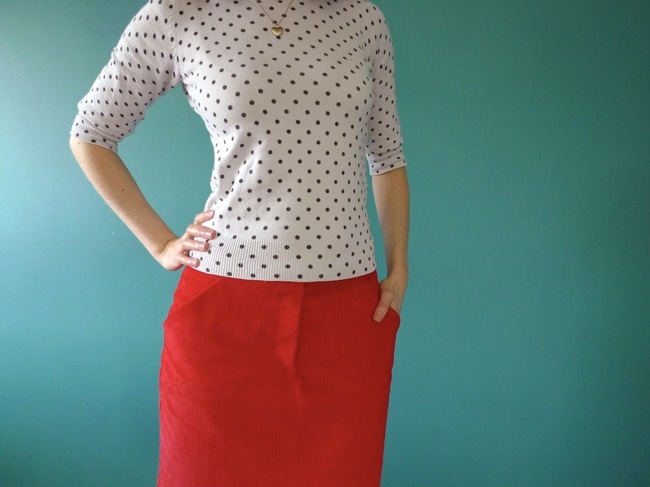 The Moss Mini Skirt - or Not Too Mini Skirt in my case - by Grainline Studio. 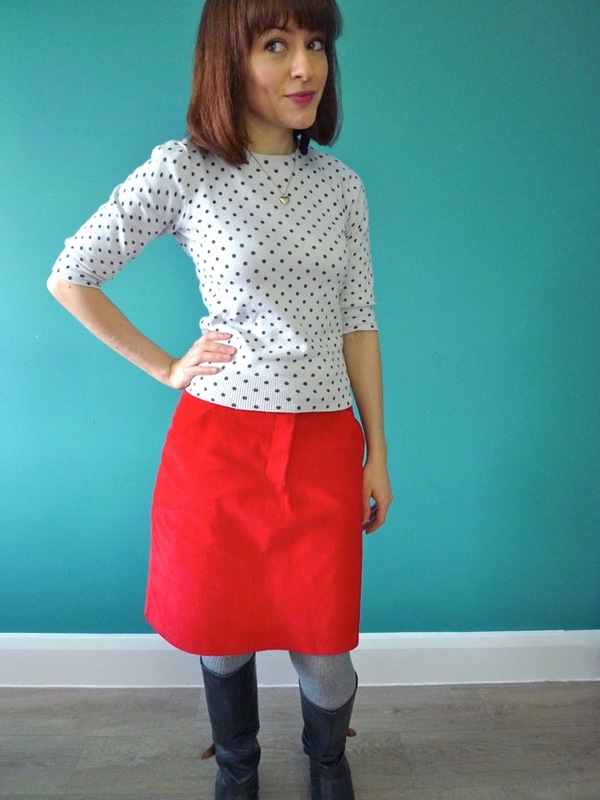 This was my first time working with a pattern by Grainline and I must say I really enjoyed both using this pattern and the novelty of diverting my sewing away from my usual choice of self-drafted, Colette or commercial patterns. The Grainline pattern line seems to fill a niche for simple (in a good way), modern and wearable patterns aimed at younger stitchers. 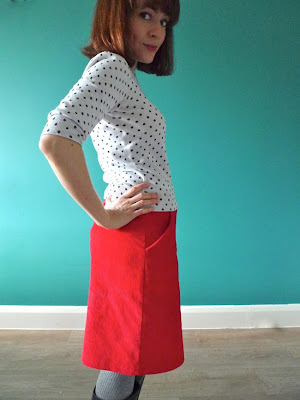 Having said that, I did lengthen my skirt significantly (3" in the end, in the middle rather than adding the hem band), so I'm clearly too grandma for the target demographic! 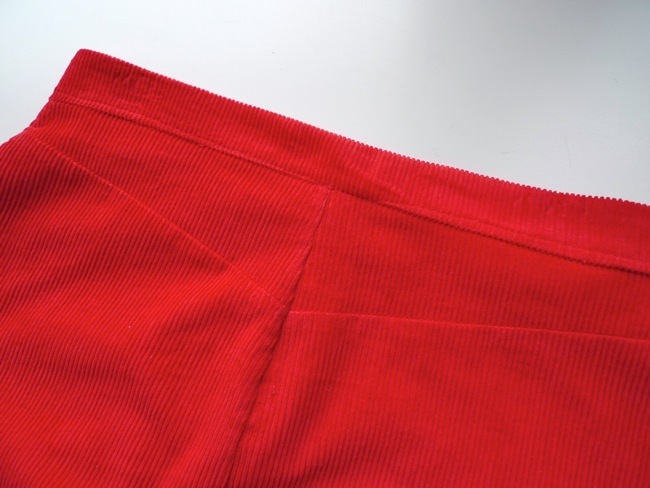 The skirt has some lovely style lines, such as the triangular back yoke pointing towards a centre seam. The silhouette is still fairly straight though, which makes it relatively simple to fit. The only change I made to the shape was to cut a triangle out of the top of the centre back seam, as I have a sway back / protruding derrière [delete according to preference]. If - or more likely when - I make this pattern again, I'd probably fit it to my waistline as opposed to this iteration's hipster fit, and would add belt loops before sewing the waistband (mmm... belt loops). 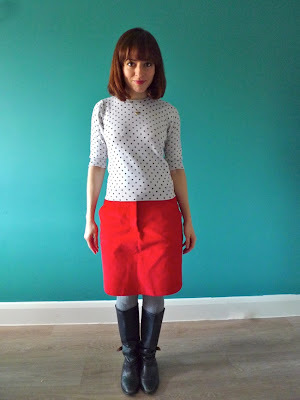 The fabric is a mega chunky tomato red corduroy which I bought on my Goldhawk Road splurge* that Jane forced me to go on. (Okay, so it may have been my idea, but all the same, Jane is a bad influence.) 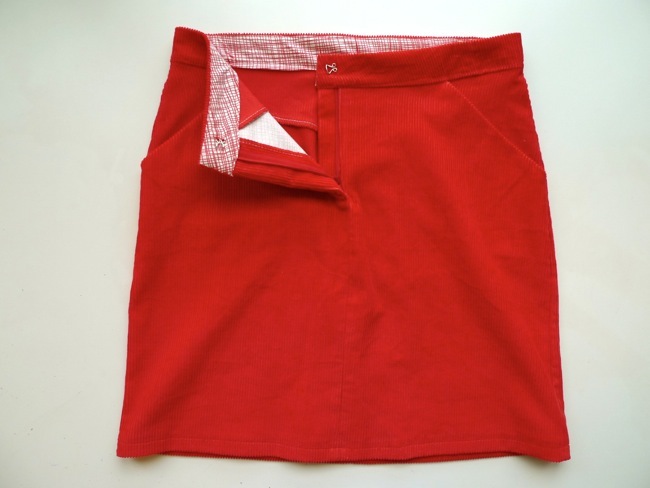 As the fabric was so thick, I decided to make the pockets, pocket facings and waistband facing in a medium weight Summersville cotton leftover from my Life's Too Short skirt. Even then, the thickness of some of the layers - particularly around the zipper - played havoc with my poor little humble sewing machine. Needles were snapped. Bobbins were scratched. (I know!!) Expletives were uttered. And a random little nubbin was left at on the fly opening. But we got through it, and I LOVE the result. 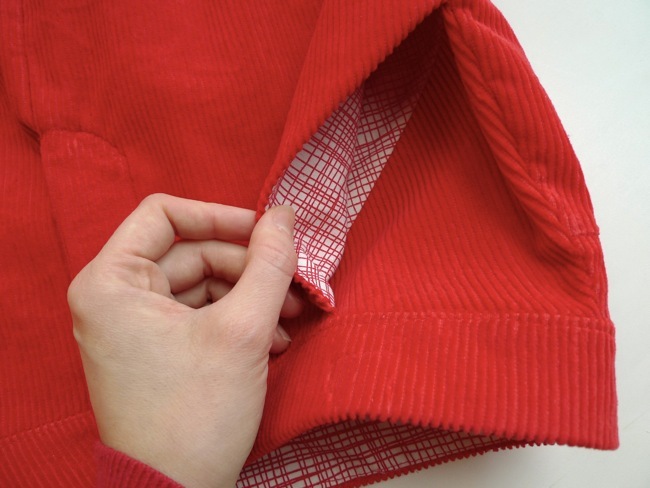 I have a funny story about sewing a fly zipper which I will regale you with one of these days. But until then, let's admire my lovely skirt. Definitely cake. *Speaking of fabric splurges, I will be exercising extreeeeme will power at Stevie's Walthamstow meet-up on 2nd February. I'm gathering up some lovely patterns and fabric to bring to the Swap. Hope to see some of you there!